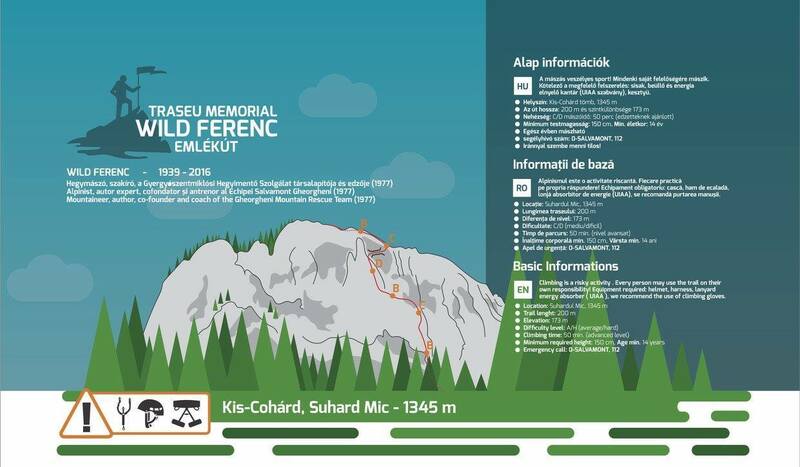 The “Wild Ferenc” via ferrata route was opened in autumn 2016, in Suhardul Mic mountain (1345m), near Red Lake, in Bicaz Gorge, Harghita county. It is named after a well known local climber, the author of the only topo map of Bicaz Gorge. The route was designed and built by Salvamont „Dancurás” Harghita, a Romanian mountain rescue unit from Harghita county. GPS access / Parking: 46°47’41.8″N 25°47’52.4″E or 46.794944,25.797889. GPS Start Via Ferrata: 46°47’54.3″N 25°47’36.4″E or 46.798428,25.793445. Access: The access trail starts near Turist Hotel, at 46°47’41.8″N 25°47’52.4″E (or 46.794944,25.797889). From there, you follow the hiking trail marked with a Blue Triangle, towards Suhardul Mic. Along the trail you’ll see wooden plates with „Wild Ferenc” written on them. These are pointers towards the start of the via ferrata route. From the hiking trail, you take a right at 46°47’52.0″N 25°47’35.8″E (or 46.797765,25.793276) towards the base of the high rock, still following the „Wild Ferenc” wooden plates, through a short rock scree. Total time so far: 20 minutes or more. The via ferrata cable starts at GPS 46°47’54.3″N 25°47’36.4″E (or 46.798428,25.793445). Length of via ferrata route: 200m. Vertical climb: 173m. Difficulty: C/D (medium/difficult) – not a route for beginners. Grades are from A (very easy) to E (extreme). The „Wild Ferenc” route is structured, from start to top, like so: B-C-B-D-bridge-C-B. The most difficult part is the „D” part, right before the bridge, slightly overhanging and exposed, with fewer rock grips – you’ll rely on the cable here to pull yourself upwards. Duration for the via ferrata route: 50 min for advanced climbers. The route can be done by persons of minimum 14 years of age, 1.50m tall, in good physical shape. Mandatory gear: alpine helmet, alpine harness, via ferrata set. Optionally, gloves. On 04 June 2017 you could not rent via ferrata kits from around Red Lake, but you could rent from Maia Outdoor, in Piatra Neamt. Return trail: From the top of the via ferrata route, make a left and follow the Blue Triangle hiking trail back to the base, where you started. This should take you 20 to 30 minutes. Wheater: Meteoblue Lacu Rosu, Viewweather Lacu Rosu. Emergency calls: +40.SALVAMONT, which is actually +40.725.826.668, or 112, the European all around emergency number. GPS coordinates for localization: 46°47’56.9″N 25°47’33.5″E. We last covered the route on 4th of June 2017.